A trusted name in optics, Bushnell’s G-Force DX ARC Laser Rangefinder combines ease of use with cutting-edge performance. This rangefinder is perfect for the experienced user, offering precision and clarity in a range of conditions. The G-Force DX ARC Laser Rangefinder is also good for the new user, boasting intuitive controls and quick response time. The G-Force replaces the Bushnell Legend 1200 ARC rangefinder, a popular product with bowhunters that has now been discontinued. The G-Force DX ARC is built to last. Bushnell equips the rangefinder with a metal housing that holds up in rugged conditions. The rangefinder comes with rubber grips that provide comfort and slip-resistant handling in wet and cold conditions. Powered by a 3V lithium battery and weighing less than 8 ounces, the G-Force is light and easy to hold for long periods of time. It also fits easily into a pocket. With one-button operation and targeting, the G-Force is a cinch to use. With 6x optics, Vivid Display Technology, and an effective 5-1300 yard range, this rangefinder is clear and accurate. The V.D.T. yields peerless image clarity and great image contrast. With several light intensity settings, users can adjust the rangefinder to fit all outdoor lighting conditions. Bushnell’s second-generation E.S.P. technology makes the G-Force DX ARC quick and accurate. Shooters will find accurate ranging within a few feet. The response time between sighting and ranging is fast. With an integrated inclinometer and settings for both bow and rifle hunting, the G-Force provides precise readings for a variety of users. Bow hunters will find accurate horizontal distances, while rifle hunters will be able to use bullet-drop readings to maximize shot accuracy. With the tripod mount, Bushnell affords shooters stability over long outings. Although the G-Force DX ARC allows users to adjust the intensity of its display, the red readout can be difficult to see in certain conditions. The single-button operation is effortless; however, the button that operates the rangefinder also selects the finder’s various modes and can be easy to bump. Finally, the $400 price tag may be a bit steep for some users. This excellent rangefinder offers a wide array of shooting modes and angle range compensation. Angle range compensation allows for shot correction on the rangefinder itself. Rifle and Bow Modes help shooters scope accurate horizontal distances and account for bullet-drop and lag time. Brush Mode lets shooters to ignore foreground objects in order to range accurate background objects, and Bulls-Eye Mode offers the opposite experience. Shooters can range small foreground objects with precision and ease. Reviews suggest that red display on the G-Force DX ARC is the rangefinders biggest drawback. A black display would be easier to adjust and to read in a wide array of conditions. However, the overall performance of the G-Force DX ARC is strong enough that many users will be able to overlook this issue. This rangefinder is fully waterproof. The lens is coated in a water-repellant coating. Rain Guard HD makes the lens resist both water and fog as well as humidity-induced or early-morning condensation. Clarity and visibility are never compromised. 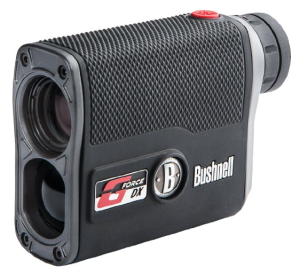 Bushnell makes quality rangefinders, and the G-Force DX ARC is in a class by itself. With superior accuracy and image clarity, this range finder is easy enough for a novice shooter to use while still providing the cutting-edge technology and precision that experienced shooters demand. Durable and accurate in any condition, the G-Force DX ARC is costly. However, the performance of the G-Force more than compensates for its price. The G-Force DX ARC may be the only rangefinder a shooter ever needs.